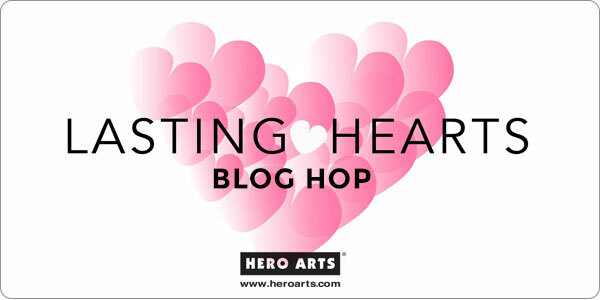 Hello all and thank you for joining us today for the Lasing Hearts Blog Hop hosted by Hero Arts. You can read more about Lasting Hearts and how YOU can support this amazing cause below. I decided to keep my card simple. 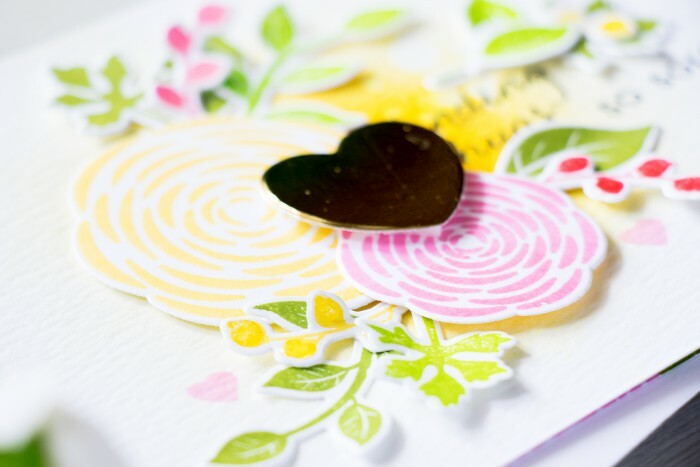 I started by blending Distress Wild Honey and Mustard Seed inks onto Tim Holtz watercolor paper and adding droplets of water. 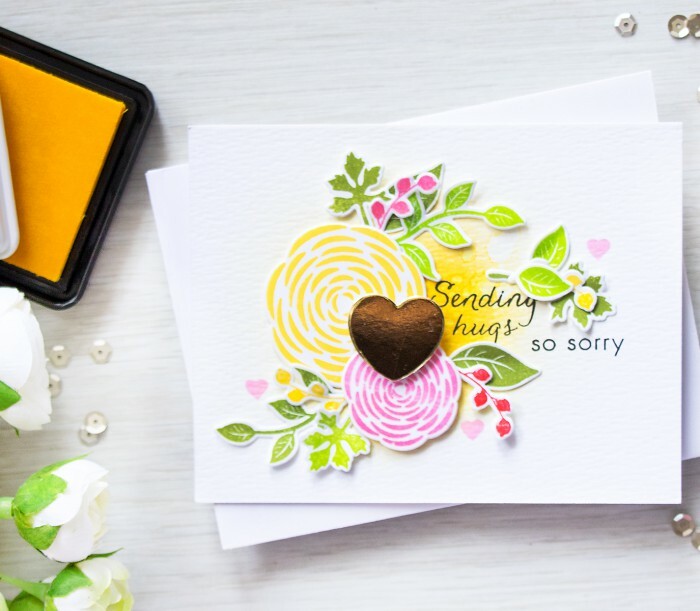 Next I stamped Sending Hugs and So Sorry sentiment in black ink from the So Sorry Stamp & Cut set from Hero Arts. Hero Arts is donating 25% of the profits from this and a few other stamps to support the Lasting Hearts efforts, in cooperation with Angela Miller, the author of “You Are The Mother of All Mothers. I also stamped and die cut a number of flowers and leaves from the You’re So Lovely set. I used Dandelion Hybrid ink, Ultra Pink and Strawberry Hybrid for the flowers and Green Apply and Moss Hybrid inks for the leaves. I die cut a heart out of gold mirror cardstock using a die from the Stamp & Cut set from Hero Arts and foam mounted it over the floral cluster. Lastly, I added glossy accents over the yellow, pink and strawberry berries. 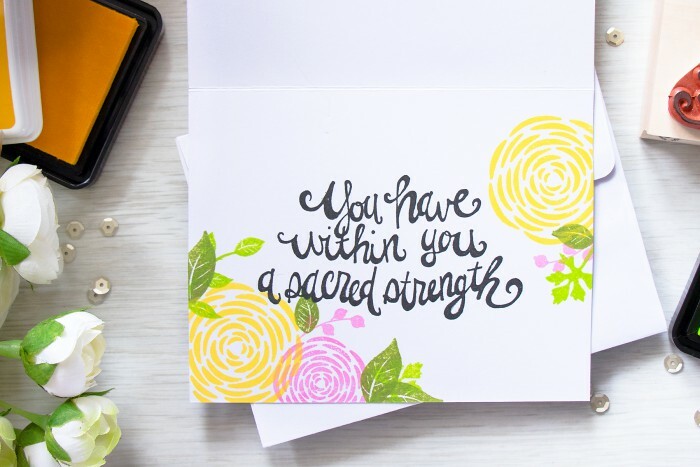 The inside of the card was also hand-stamped with a powerful You Have Withing You a Sacred Strength message. Lasting Hearts was started by Kimberly Saldaña, Director of Sales at Hero Arts. Lasting Hearts is here to help comfort parents, mothers in particular, who have lost a piece of their heart. Learn more HERE. Be sure to visit everyone on the hop list and leave a comment. 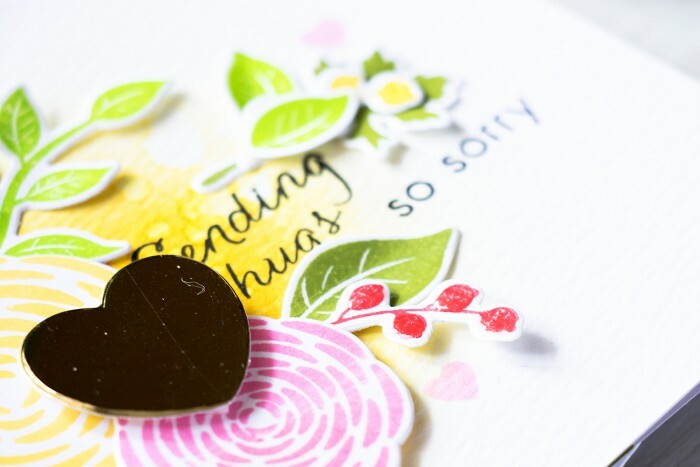 Hero Arts is giving away a special prize to three lucky commenters – Angela Miller’s “You Are the Mother of All Mothers” book, as well as the So Sorry Stamp & Cut set. Please comment by Sunday, March 6 at 11:59 PT, winners will be announced next week on Hero Arts blog. Wow!!! What a lovely initiative!!! Your card is amazing!!!! Love the sentiment!!! What a beautiful card! I really like all the die cuts. What a beautiful card! I really like all the die cuts! Beautiful card. I love the tiny hearts you scattered around the flowers. Thanks for sharing the inside of your card too. Your support of the card drive is appreciated. Beautiful card as usual Yana! You always make such beautiful arrangements on your cards!! Very pretty how you combined these colours and flowers! lovely card for those who need support. 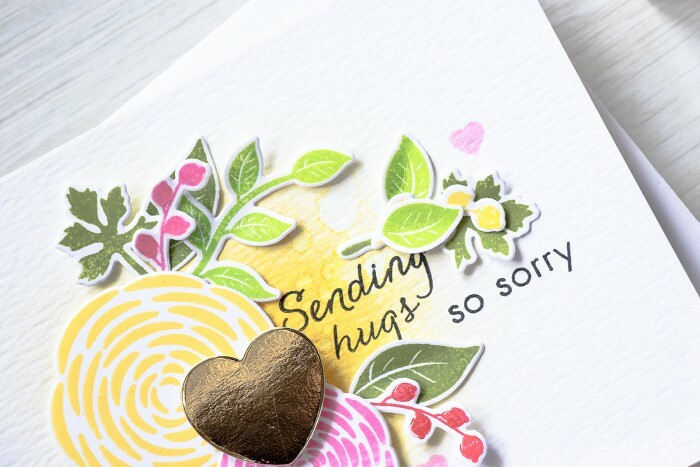 Such a bright and cheery card for someone going through something so tragic. Lovely card and beautiful touches added! Such a pretty card – the yellow just pops. What a wonderful card to send someone going through something so tragic. I love the watercolor effect and the coordinating inside of the card. 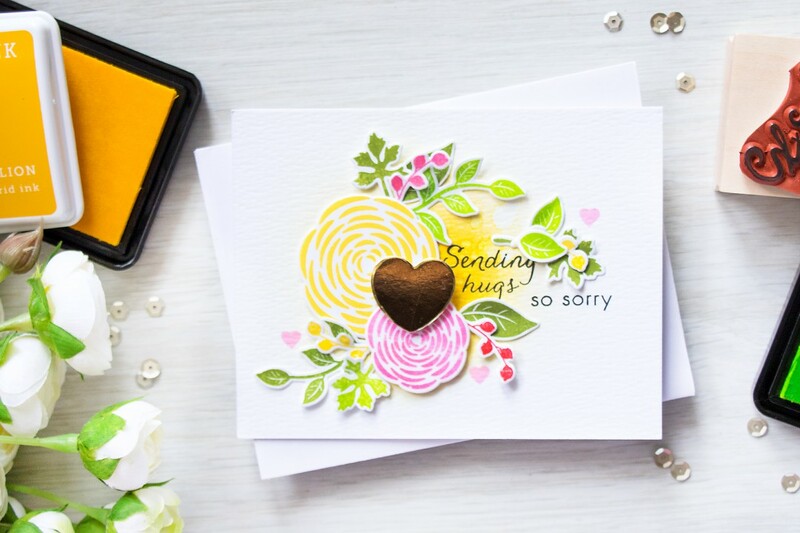 Pretty and bright colors cards with perfect sentiment. Oh, I really love the card. The recipient will be so touched! Love the yellow back ground. What a great idea, it just ties everything in together. Thank you. Your bright colored card turned out really nice. Love the card. Gold heart is so touching. What a bright card to cheer someone up with. Thank you for sharing with us. Very pretty card Yana. Bright & cheery! I enjoy your cards, they are so creative! Thanks for sharing! I certainly like what I see. You said you were going to have a simple card…wow, I think it’s quite intricate and beautiful. Thank you. Your card is lovely. I like the flowers and the encouraging sentiment. Colors are uplifting. Thanks for sharing. Yana, you always make such beautiful cards. I love your coloring and design. Thanks for sharing. Very striking card, Yana, with a heartfelt message! Great way to end a very worthy and inspiring hop. Such a beautiful card, love that it is stamped outside and inside! Lovely card. I just received my stamps and dies on Sat. Anxious to give it a go. This is a gorgeous card, inside and out! Beautiful card. I love the gold heart element. Oh so pretty and colorful. Love the stamp set with the dies. Thanks for sharing.